Garden chairs need to be comfortable and good-looking and weather-proof. After all, you’ve worked hard to create the perfect garden, so now all that’s left to do is find some stylish pieces of garden furniture to make your garden summer-ready. Whether your garden features solitary corners made for relaxing with a book or a pocket-sized patio area perfect for enjoying a glass of wine, our selection of the top outdoor chairs will provide you with plenty of inspiration so you can enjoy the best of the British summer. After reading, why not check out our guide to choosing garden furniture? When it comes to deciding on the best outdoor chairs for your garden, make sure you consider the material and maintenance requirements of your choice. 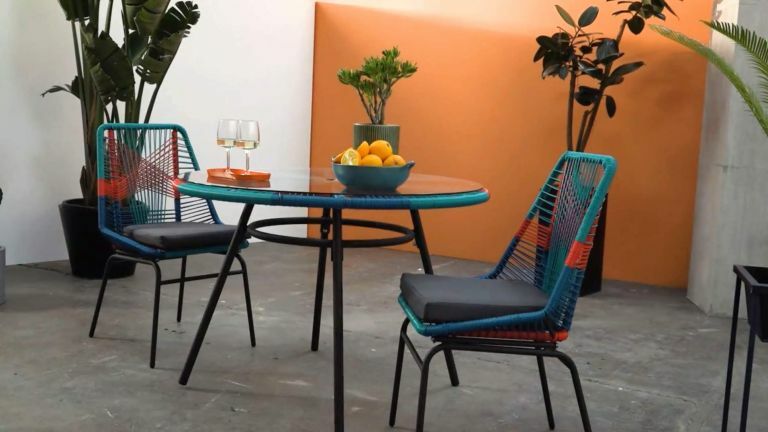 Rattan pieces such as the House by John Lewis Salsa Garden Chair can stay outside all year round but hanging chairs, sun loungers and metal furniture may need to come inside once autumn comes round. You should also watch out for whether you’re paying for one chair or two; not all outdoor chairs come in pairs and you don’t want to end up paying over the odds for a full set. These Salsa garden chairs from John Lewis will certainly draw the eye, especially if you like the look of the Saffron and Heatwave colours. They’re perfect for bringing a touch of summer to your garden and thanks to their metal and rattan composition, they can remain outside all year round, serving as a reminder of summer even in the dingiest of winter weather. Take your morning cup of coffee out to the garden; this lightweight but sturdy all-weather bamboo chair has been mounted onto a stainless steel base and will do just fine in any type of weather, although the manufacturer does recommend covering it if left outside for long periods of time. We love the unusual shape, which makes for a welcome contemporary update on the traditional rattan look. Described by the brand as groovy and graphical, this outdoor garden chair is all about relaxing with a difference. Featuring a vibrant, jungle-like colour scheme, the Copa garden hanging chair has been designed to stand out and fit right in all at the same time. The chair comes with a comfortable, padded cushion, while the outside unit is weather resistant enough to remain outside all year round. Boldly simplistic in its design, this garden bench, with its natural teak finish will blend beautifully into your garden greenery. With space for three people to sit, it’s a great piece of furniture to have if you host garden parties. Habitat mention that it’ll weather over time, bringing a character and warmth to the outdoor chair. It can be purchased alongside a table and an additional bench for a stylish outdoor dining set. There’s nothing wrong with buying a cheap metal sunlounger until you sit on it and it collapses inwards on itself or topples over backwards. This outdoor chair is made from strong eucalyptus wood and has been well constructed to defy the sunlounger curse. The chair offers five reclining positions, perfect for sunbathing and reading, while the seat pad should provide plenty of comfort for long stints in the garden. If you like the eccentricity of the Copa Garden Hanging Chair, then you should certainly make room for this dining chair set, too. Blending summery tones of blue and red, these chairs are modern and playful and will make the perfect choice if you’re looking to brighten up any patio or decking area. The outdoor chairs are made from polyrattan, so they’re weather resistant to an extent – just ensure you bring them inside when the weather turns. This chair created by John Lewis has all the design credentials of an indoor armchair, but is made from durable eucalyptus a dense synthetic wicker that make it perfect for outdoor use. It comes with a seat and back cushion. Classy and comfy. Bring a chic, ultra-modern design to your garden with this stackable chair make from lightweight and weather-resistant resin. Get several of them to create a trendy outdoor dining area perfect for BBQs.